Hello gamebookers! Today, I revisit a type of post I did on my first April A to Z - a post of villains. Back in 2011, I picked 26 villains, each one with a name beginning with a different letter of prominence, hardness, ambition, style and diabolical genius. 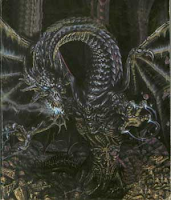 Since I was restricted by letter of the alphabet, I had to gloss over a few great villains, but now I free from such constraints, I am going to return to the format and profile some more great villains, starting with The Night Dragon. Appears in: Night Dragon (Fighting Fantasy 52) by Keith Martin and illustrated by Tony Hough. Background: The Night Dragon was a terror centuries ago before it got put to sleep. However , it is now waking up and it seems that nothing can get in its way. Modern dragons are oathbound not to fight it (bit of a stupid oath there) so they have to recruit an adventurer to do the dirty work for them. Otherwise all Allansia will fall. Hardness: The base stats for the Night Dragon are Skill 17 Stamina 32, already putting it more powerful than the Zagor Demon. Even Razaak would be hard pressed to get his famous two consecutive strikes in against that. The only Fighting Fantasy Villain with a higher skill is the Titanium Cyborg, but he needs lots of futuristic technology to do that. I haven't even talked about how the stamina of 32 is the minimum stamina - it will be higher. How much higher depends on how long you took to get there. Then you have to add into the fact that unless you have some pretty powerful magic items, you will lose 1 skill point when you meet it and any blow against it will be negated on the roll of a 6. I also haven't yet mentioned its powerful breath and magic. Put these all together and the Night Dragon is truly a formidable enemy. And even when you beat it in combat, it still isn't dead. You have to fight its skull. I think all of these combined mean that the Night Dragon gets a well deserved 11/10. Ambition: All of Allansia will be destroyed by the Night Dragon if he (?) succeeds. Also a bonus point for taking over Dreamtime. 10/10. Style: The Night Dragon's cult is smart about achieving its aims - it knows that it's not huge, so it drugs the populace or starts a reign of terror. It hires the right people - wizards and high priests - to get things done. It kills off your informants before they can give you much information. However, individuals do not really stand out much - the cult is defined by robe colour, mainly and two grey robes are pretty much alike. Also, the Night Dragon itself does not have much of a personality. It doesn't even seem to enjoy the terror it spreads, making it a bit flat. 7/10. Diabolical genius: The Night Dragon's cult displays quite a lot of initiative in spreading its reign of terror (the aforementioned mass drugging for example). I'm not sure how much of this was actually the Night Dragon's idea or how much was up to the cult. I get the impression, however, that it is the cult that is coming up with all of this with the end of awaking the Night Dragon. In that case, the dragon itself falls into the trap of being the big boss monster in a dungeon. The traps, the wizard's attempts to strengthen the dragon and the stalkers all seem to be the cult's ideas, making the Night Dragon more of a figurehead than a leader. It's fighting style also does not display much genius - cast lots of spells, breath fire and be hard. 6/10. Total score: When it comes to raw power, no one can match the Night Dragon. However, it needs other people to do the thinking for it and it doesn't really have an MO beyond mindless destruction. However, there will be a LOT of mindless destruction. 44/50.